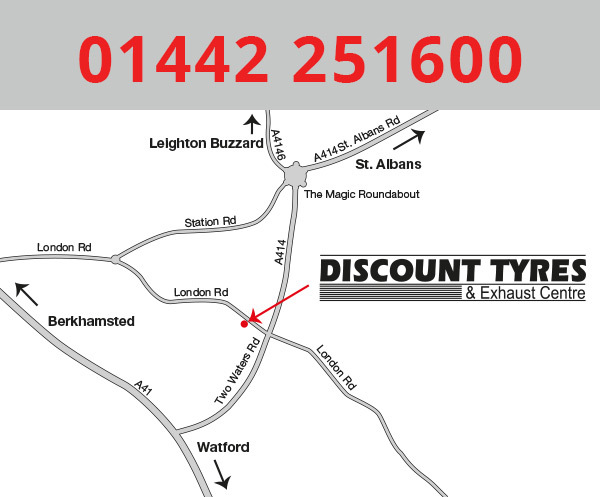 Discount Tyres is Hemel Hempstead’s premier Tyre Store and Exhaust & MOT repair Centre. Visit us on London Road in Hemel Hempstead. Choose from our selection of car, 4x4, performance and van tyres and stay for our full exhaust and MOT repairs services. Our auto repair shop provides wheel alignment, brake service, batteries, suspension work and general car servicing. 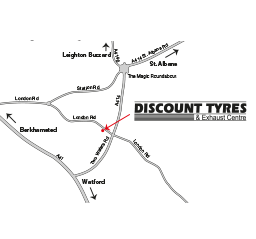 Contact our knowledgable staff today to learn more about how you can save with Hemel Hempstead’s best tyre shop. ☆☆☆☆☆ Went into discounts today! As a single women l find garages quite intimidating and also a rip off. From Passed experience has always been one tyre becomes four. Well not here. This place is honest, trustworthy and professional. I was offered coffee on arival and offered different options and also the guy took me to my car to show me too! Even on leaving the guys said if ture pressures become low or if theres anything lm unsure of pop in anytime! These guys are amazing! Me and my children will be safe and l feel comfortable enough to go back whenever theres a problem!!!! I would highly recommend this place great customer service and price!!!!!!!!!!!! Keep up the good work guys!!!!!!!!!!!!! ☆☆☆☆☆ Called then up 8:30am with a puncture repair request, after I managed to hit a kerb, swerving to miss another driver. They had it fixed and I was back on the road by 9:30am. Awesome work! Site by Big Marketing Ltd.